About this photo... Sorry, it was delivered in all caps. O.K. 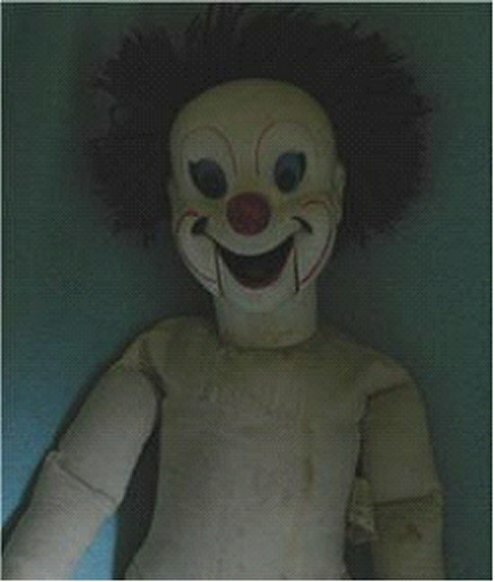 PLEASE HELP ME TO FIND A NEW HOME FOR THIS HAUNTED CLOWN DOLL. I FOUND THIS DOLL AT A ESTATE SALE ABOUT A YEAR AGO AND I CANNOT HAVE HIM IN MY HOME ANYMORE. THE LADY AT THE SALE SAID THIS WAS HER DECEASED SISTERS DOLL AND WHEN SHE DIED IT WAS NEXT TO HER IN HER BED. UNKNOWN CAUSES FOR HER DEATH. I DID NOT BELIEVE THE LADY ABOUT THE DOLL BEING HAUNTED, BUT WHEN I GOT HOME WITH THIS DOLL I LEFT HIM IN MY GARAGE. I SHUT THE GARAGE DOOR & I CAME INSIDE, A FEW MINUTES LATER THE GARAGE DOOR OPENED. SO I WENT TO SEE WHAT WAS GOING ON AND THE CLOWN WAS ON THE OTHER SIDE OF THE GARAGE. WEIRD SO I PUT HIM ON A SHELF AND WENT BACK INSIDE. NOW I HAVE 2 CATS AND THEY WILL NOT GO NEAR HIM IN THE GARAGE. MANY TIMES I WOULD DRIVE INTO MY GARAGE THAT CLOWN WOULD BE ON THE FLOOR RIGHT IN THE AREA TO PARK. SO I WOULD HAVE TO GET OUT OF MY CAR MOVE THE CLOWN AND THEN DRIVE IN. RECENTLY I WENT TO GO AND BRING HIM IN THE HOUSE FOR MY DAUGHTERS SLEEP OVER, WHAT A MISTAKE. THAT DID NOT GO WELL THAT NIGHT! THE GIRLS STARTED PLAYING WITH THE CLOWN AND TOSSING HIM AROUND. OH, THE NEXT THING THE CATS GO CRAZY JUMPING AROUND AND HISSING I HAD TO PUT THEM ON THE BACK PORCH. THEN AROUND 1 A.M. THE GIRLS STARTING SCREAMING & CRYING. THEY SAID THE CLOWN WOKE THEM UP AND WAS LAUGHING AT THEM. SO HE IS BACK IN THE GARAGE FOR NOW ! SO IF YOU ARE INTO THIS WEIRD HAUNTED STUFF THIS CLOWN IS FOR YOU !! HE IS A LARGE DOLL -28 INCHES TALL. The doll went up for sale on eBay at some point. My email says 2007... but the actual auction may have even been years before that. Unfortunately I no longer have any info about the auction or what the doll sold for. I had just happened to rediscover it in an old email folder. Posting it just for fun... but with the possibility of it actually being haunted. Is it Possessed? Maybe...... Is there an Evil Spirit Attachment? Maybe. Will it come after us if we stare at it too long? I hope not! Reminder... we're not looking for analysis with this picture. Enjoy! 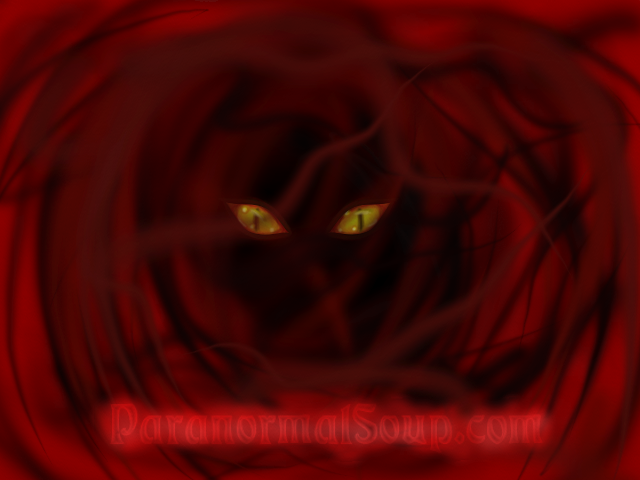 You're seeing it first before it's posted on GhostsStudy.com! This is why I hate clowns!!! That thing is terrifying. It doesn't 'feel' good. I believe that's a Bozo the Clown doll. a naked bozo the clown doll! 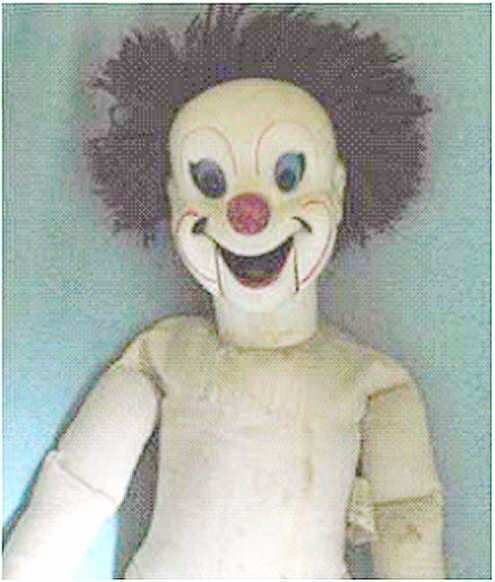 Haunted Bozo doll at your service. Ready to make your haunted fantasies come true! Why are most haunted dolls naked? I hate clowns. With clothes, without clothes, doesn't matter they're all freaky and ugly and scary. Whole lotta nope for me. Lol, if you see a clown without clothes, you are at the wrong kind of circus. I wonder where he is now and what the current owner has to say.... I hope he's in a good home! they tear them off in fits of rage? I recognized him, because I grew up watching Frank Avruch asBozo in Bozo's Circus. This is a photo of Frank as Bozo. Edited by MacCionoadha BeanSidhe, 02 August 2017 - 09:11 PM. I guess it could have been worst than Bozo the clown. Imagine waking up to this one at 3 AM in the morning! So does my sister. She was terrified of them when we were little. Seeing one would send her into a fit. Now she just stays away from them.